2.3.1 Parameters affecting the gelation rate: pH and polymer concentration. This warranty limits our liability to replacement of this product. No other warranties of any kind, expressed or implied, including without limitation, implied warranties of merchantability or fitness for a particular purpose, are provided by Cellendes. Cellendes shall have no liability for any direct, indirect, consequential, or incidental damages arising out of the use, the results of use, or the inability to use this product. Products of the 3-D Life Hydrogel system are covered by patents from NMI Natural Sciences and Medical Institute at the University of Tübingen and Cellendes GmbH. Purchase of these products conveys a license for use for research. For further information please contact Cellendes GmbH. 3-D Life products are for research use only. Research over the past years has shown that the physiology of cells cultured in vitro in three dimensional systems (3-D) resembles that of their counterparts in vivo much better than the physiology of cells cultured conventionally on flat surfaces of tissue culture plates. This is reflected in differential gene expression  and a difference in cell behaviour and differentiation . As a consequence, 3-D cell culture is often the better choice for investigating cell function . Hydrogels, consisting of synthetic and chemically defined components can be modified to mimic the characteristics of natural extracellular matrices . These biomimetic hydrogels can provide valuable insight into the regulation of cell function and developmental processes in tissue- and organ-specific differentiation and morphogenesis, which depend in many ways on the extracellular environment. When the two components are mixed in the presence of cells, thiol groups form stable thioether bonds with thiol-reactive groups, which result in the formation of a gel containing embedded cells. Prior to the crosslinking step, a peptide (containing e.g. cell adhesion motifs) may be covalently attached to a portion of the thiol-reactive groups of the polymer. The hydrogels can also be used to culture cells on top of the gel (see Chapter 4.1.3). Either polyvinyl alcohol (PVA) or dextran are available as thiol-reactive polymers. 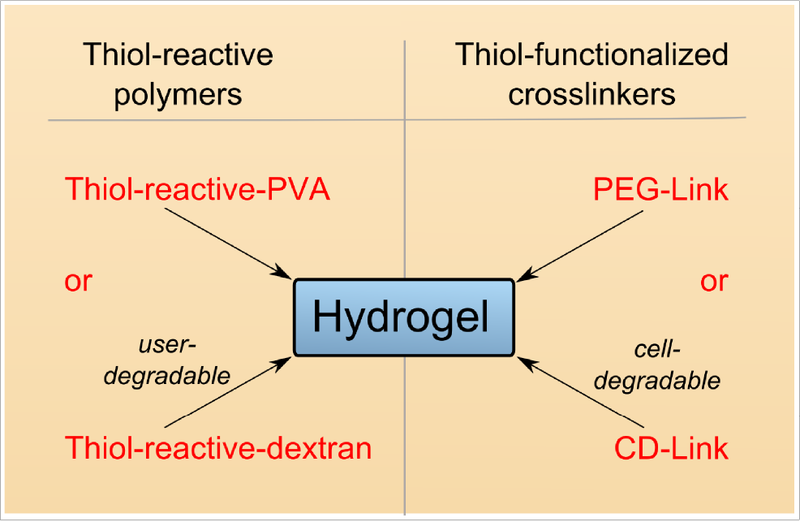 Hydrogels based on the PVA polymer are stable and cannot be degraded by the user, whereas dextran hydrogels can be degraded by addition of the enzyme dextranase to isolate cells from the hydrogel for further use. 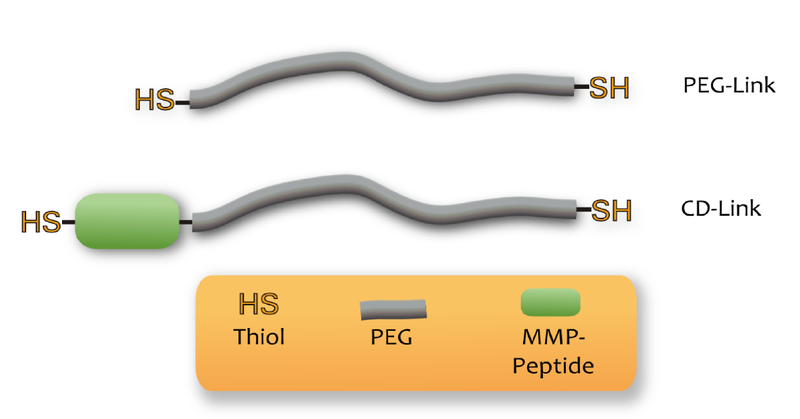 Both polymers can be crosslinked with either polyethylene glycol (PEG-Link), which is a stable, non-degradable linker, or a polyethylene glycol peptide conjugate (CD-Link), which contains a matrix-metalloprotease cleavable peptide that allows cells to cleave the crosslinker and spread and migrate within the gel (for further details see also chapter 4.1.2, page 13). The thiolreactive polymers and the thiol-containing crosslinkers can be mixed and matched to set up gels of defined properties (Figure 1). The procedure for setting up biomimetic hydrogels containing embedded cells is very simple and does not require specific equipment or chemical expertise (Figure 2). Figure 1: Thiol-reactive polymers (functionalized PVA or dextran) can be combined with thiol-containing crosslinkers (either PEG-Link or CD-Link) to set up gels with undegradable, user-degradable properties, as desired. PVA, dextran and PEG are water-soluble polymers; they do not bind to cells  and are known not to interfere with cellular functions. Thus, 3-D Life gel components support cells in an inert gel, which provides an ideal basis for analyses of cell phenotype as a function of added bioactive factors, such as adhesion peptides, extracellular matrix proteins or fragments thereof. Figure 2: Schematic drawing of the three simple steps required to embed cells in a peptide-modified hydrogel. 1. Polymer, bugger, water and peptide are mixed and incubated to covalently attach the peptide to the thiol-reactive polymer. 2. A cell suspension is added to the peptide-polymer conjugate solution. 3. Cells and the peptide-conjugated polymer are mixed with crosslinker for gel formation and placed on a culture dish. After the gel is formed, it is immersed in culture medium and the culture dish is placed in an incubator for cell cultivation (not shown). For fast gelling hydrogels PVA or dextran are functionalized with many thiol-reactive maleimide groups along their backbone (Figure 3), sufficient for modification with bioactive factors and for crosslinking. Maleimides react specifically and very rapidly with thiol groups so that hydrogels can form within a few seconds. For hydrogels with a slower gel formation rate, PVA or dextran are functionalized with thiol-reactive groups which react at a slower rate with thiol groups than maleimides, but with a similar reaction mechanism. PEG-Link consists of linear polyethylene glycol with a thiol (SH) group at each end ( α,ω- bis-mercapto polyethylene glycol). CD-Link is derived from PEG-Link. It contains a peptide with a cleavage site for matrix metalloproteases (MMP; Figure 4). In the 3-D Life system thiol groups form stable thioether bonds with thiol-reactive groups under physiological conditions in a reaction called Michael Addition. The reaction usually proceeds at neutral pH. As the pH is lowered, the reaction slows down, since thiols react as deprotonated thiolate anions with thiol-reactive groups. Thus, the reaction rate can be controlled by altering the pH. The reaction rate also increases with increasing concentrations of reactive groups (see Figure 5A for an example), which is important to consider when higher polymer concentrations are used for setting up stronger gels. The reaction of thiol-reactive groups with thiol groups is very specific and the reaction proceeds in the presence of cells without any harm on their vitality. The two thiol groups of the crosslinker molecules PEG-Link or CD-Link react with thiolreactive groups of different polymer molecules. This leads to large polymer-crosslinker networks, which form a gel. Gel formation occurs best at equimolar concentrations of thiol and thiol-reactive groups, starting at approximately 1.8 mMol/L of each group. Higher equimolar concentrations of the reactive groups result in stronger gels which form faster (see Figure 5A for an example). Two 10-fold concentrated buffers (10x CBpH 7.2 and 10x CBpH 5.5) are available for setting up fast gelling and slow gelling hydrogels. At one-fold concentration, the buffers provide an isotonic environment at pH 7.2 or pH 5.5, respectively. 10x CBpH 7.2 is recommended for slow-gelling hydrogels to ensure an optimal environment for the cells during setup. For fast gelling hydrogels 10x CBpH 5.5 is recommended, because fast gelation at a higher pH can prevent homogenous mixing of polymer and crosslinker before the gels begin to solidify. The lower pH slows down gel formation allowing sufficient time for mixing (Figure 5A). Most cells are not affected by a short exposure to pH 5.5. Alternatively, both buffer systems can be mixed at any ratio to generate intermediate pH values (Figure 5B) to adjust gelation times of either gel system, fast or slow gelling. Both buffer systems have a strong buffering capacity to ensure a stable pH. They also contain phenol red as a pH indicator, which exhibits a gradual color transition from red to yellow as the pH shifts from alkaline to acidic. Peptides can be covalently attached to a portion of the thiol-reactive groups of the thiolreactive polymer. The peptides must contain a thiol group, which can easily be inserted by including a cysteine residue during peptide synthesis (see chapter 3.6). If comparative studies at different peptide concentrations are to be made, a corresponding amount of a cell neutral compound containing a thiol group, such as 1-thioglycerol, should be added to ensure equal gel strengths (see Table 4 and 5). We recommend final peptide concentrations of up to 0.5 mMol/L, if only one kind of peptide is used in a single hydrogel. Higher peptide concentrations up to 5 mmol/l may be used. This is especially convenient when different kinds of peptides are to be immobilized in the hydrogel. Soluble extracellular matrix proteins (e.g. fibronectin, laminin) or protein fragments can be added to the polymer solution prior to crosslinking. The protein solutions should contain no reducing agents, such as dithiothreitol or 2-mercaptoethanol, which would inhibit gel formation. We recommend to start with a concentration of 30 µg/ml protein in a hydrogel that is crosslinked at 3 or 4 mMol/L thiol-reactive groups. The concentration of the extracellular matrix proteins may be varied. An example of mixing a fibronectin-modified Hydrogel (30 µg/ml fibronectin in PVA-Hydrogel) is shown in Table 1. 1 Concentration of thiol-reactive and thiol groups for crosslinking: 4 mMol/L each. 2 Volume of 10 x CBpH 5.5 is calculated for the total volume minus the volume of the cell suspension to ensure isoosmotic conditions. Some 3-D Life product components are stabilized by lyophilization and must be dissolved before use. Carefully follow the procedure for reconstitution as described in the data sheets to make sure that the components dissolve properly. Maleimide groups are inactivated by hydrolysis in water at a very low rate. This reaction proceeds faster at higher temperatures. Therefore, maleimide-containing reagents should be kept on ice during use. If stored at -20°C, PVA-based polymers may form insoluble aggregates within weeks to months. Therefore, Mal-PVA and SG-PVA should be stored at -80°C, at which temperature it is stable. It is recommended that it be stored in small portions to avoid frequent freeze-thaw cycles. If necessary, SG-PVA can be stored for up to one week at 4°C. 3-D Life Dextranase is based on a dextranase preparation from Chaetomium gracile (5). This enzyme can be stored for several months at 4°C, where its activity decreases by approximately 30% per year. Prolonged storage should be at -80°C. Thiol groups can form inactive disulfides upon exposure to oxygen. As this reaction can be substantially slowed down at acidic pH, PEG-Link and CD-Link are provided in a mildly acidic environment. Prolonged exposure of PEG-Link and CD-Link to air should be avoided. The buffers 10x CBpH 7.2 and 10x CBpH 5.5 can be stored for up to 1 month at room temperature or at 4°C. Prolonged exposure to light, however, should be avoided. Long term storage should be at -20°C or at -80°C. During refrigeration, some of the buffer components may precipitate. Prior to use, it is important to ensure complete dissolution of the buffer. Precipitates can be solubilized by vigorous agitation at room temperature or incubation at 37° for a few minutes. Cellendes offers cell adhesion peptides for use with 3-D Life Hydrogels. Peptides available from Cellendes have been tested for biological functionality in the 3-D Life Hydrogel system. Peptides can also be readily purchased from companies specializing in peptide synthesis. A thiol group can be easily inserted by including a cysteine residue at the Nterminal end of a peptide. The adjacent amino terminus of the peptide should be protected (e.g. by an acetyl group) to remove the positive charge of the free amino terminus, which might otherwise enhance the rate of oxidation of the thiol group. In general, positively charged amino acids in the immediate vicinity of the thiol should be avoided, e.g. by employing a spacer. Only purified peptides (e.g. by HPLC) in the Cl- -salt form should be used. If possible, peptides should be stored in small portions under inert gas to avoid repeated exposure to air. In general, any cell type can be cultured in 3-D Life Hydrogels as long as the cellular environment provides all factors necessary for cell survival or cell growth. The 3-D Life Hydrogel system is designed to provide full control over the composition of bioactive components in the extracellular environment. Examples of cell cultures are described in Application Notes at http://cellendes.com/technology/applications. Cells can be embedded as single cells or cell aggregates in gels crosslinked with PEGLink. Depending on the type of cells, formation of epithelial cysts, spheroids or colonies can be obtained. The requirement of a cell adhesion molecule for specific morphological phenotypes (e.g. epithelial cysts) needs to be considered. Due to a small average pore size of the gel (ca. 10 nm) cells do not spread or migrate in hydrogels crosslinked with PEG-Link. Cells can be embedded as single cells or cell aggregates in hydrogels crosslinked with MMP-cleavable CD-Link. If the embedded cells produce appropriate matrix metalloproteases, the linker can be cleaved in the vicinity of the cells. In the presence of cell adhesion factors, containing e. g. the RGD motif, cell spreading and migration can occur. CD-Link contains the peptide sequence Pro-Leu-Gly-Leu-Trp-Ala, which is known to be cleaved by matrix metalloproteases, such as MMP1, MMP3, MMP7 or MMP9 . Cells can be cultured on the surface of 3-D Life Hydrogels. The gel must contain an adhesion factor, for example a peptide containing the RGD motif (e.g. 3-D Life RGD Peptide), that can be recognized by the cells and promote adhesion. The culture of cells on gels can be of advantage if a soft surface instead of the hard surface of a tissue culture plate is required for cell culture. Cells can also be cultured between two layers of hydrogels. Chemical fixation of cells and labeling of live or fixed cells within the gel with small molecules (e.g. fluorescently labeled phalloidin, nucleic acid stains, viability and cytotoxicity assay reagents, proliferation assay reagents based on small molecule components [e.g. Click-iT™ EdU, Life Technologies™], Ca2+ indicators etc.) can be performed with standard protocols used for 2-D cell cultures. The incubation with fixation solution and labeling reagents, as well as washing buffer may be prolonged to allow for longer diffusion times in the hydrogel. For a cell culture within a 30-µl gel, an incubation time of 30 minutes to 1 hour is recommended for labeling reagents. Cells containing genetically encoded reporters (e.g. green fluorescent protein) can easily be observed, since 3-D Life hydrogels are fully transparent. Labeling with reagents with a larger molecular mass (e.g. antibodies) within the gel is possible with overnight incubations. Alternatively, cells grown in 3-D Life Dextran Hydrogels can be recovered by degrading the gel with dextranase. The recovered cells can subsequently be treated in suspension with high molecular weight reagents. Before the isolation from dextran gels cells may be chemically fixed to preserve the 3-D cell culture phenotype. Dextran hydrogels can be dissolved by addition of dextranase. This allows the isolation of chemically fixed or live cells after 3-D cell culture for downstream processing of cells. For example, cells can be passaged for further growth or analyzed by immunostaining, RT-PCR, biochemical analyses or flow cytometry, similar to cells from 2-D cell cultures. Since dextranase degrades specifically the dextran polymer meshwork without protease activity, cells and extracellular matrix are left intact during gel dissolution. After long-term culture a disintegration of dextran gels has been observed. In contrast, PVA hydrogels are stable against enzymatic digestion and suit many applications if the analysis of the cell culture does not require the isolation of cells from the gel. The gels are stable in culture medium over weeks. If required, PVA hydrogels, which are crosslinked with CD-Link, can be dissolved by trypsin, since the peptide sequence in CD-Link is trypsin-sensitive. The properties of the dextran and PVA hydrogels are summarized in Table 2. Table 2: Comparison of dextran and PVA hydrogels. +: possible; -: not possible. *only possible if gel contains CD-Link and is digested by trypsin. Maleimide-modified polymers are used when a fast gel formation is required. For a manual cell culture setup a soft gel composition at pH 5.5 is preferred to slow down the otherwise too rapid reaction kinetics. Gels are prepared by placing the crosslinker (CD-Link or PEG-Link) on the surface of a culture dish, adding the maleimide-containing component to the crosslinker and mixing the two solutions by rapidly pipetting up and down three times. The gel forms within seconds or minutes, depending on the concentration of the poymers and reactive groups. If an extremely fast gel formation is required (e.g. robotic bioprinting) the gels can be set up at pH 7.2, where the gel forms almost instantaneously upon mixing maleimide-polymer with crosslinker. In contrast, slow gelling components allow more time for the placement of the pre-gel solution in a culture dish. Depending on the composition and concentration of the gel components the fluid condition after mixing SH-reactive polymer with crosslinker can last between 5 and 25 minutes before the beginning of gelation is noticeable. The hardening of the gel can take between 8 and 70 minutes depending on the composition and concentration of the gel components. when cells need to be above pH 7.0 at all times. Using the two types of gels, it is possible to construct co-cultures that can be subsequently taken apart by dissolving the dextran hydrogel and leaving the PVA gel intact. This may be convenient for the separate analysis of two cell populations after coculture. 3-D Life hydrogels are fully transparent and cells can be observed by any form of light microscopy, e.g. bright field and phase contrast microscopy, fluorescence microscopy, or laser scanning confocal microscopy. All specifications below apply to solutions supplied in the products or after reconstitution of lyophilisates as indicated in the Product Data Sheet. Reagent volumes for each composition of gel have to be calculated to ensure proper gel formation. As a general rule, thiol-reactive groups and thiol groups should always be kept at equimolar ratios. Accordingly, in the gel the concentration of reactive groups of polymer (SH-reactive groups) has to match the concentration of the SH-groups of the crosslinker. If peptides are included in the gel, the concentration of reactive groups of polymer has to match the sum of the SH-groups of crosslinker and peptide. The concentration of the reactive groups must be at least 1.8 mMol/L for both types to form a gel. If cells or other specimens are to be embedded in the gel, they are prepared in physiological salt solution (e.g. PBS) or medium. Since these solutions contain physiological salt concentrations, 10x CB has to be reduced accordingly. It is added as 1/10th of the final gel volume minus the volume of the cell suspension. The volume of water is calculated as the final volume of gel minus all other reagent volumes used for gel composition. Alternatively, for calculation of reagent volumes for gel preparation an online calculation tool is available at http://cellendes.com/calculation?view=application. Gel stiffness increases with increasing concentrations of thiol-reactive polymers and corresponding concentrations of crosslinker. Table 3 depicts examples for the preparation of 3-D cultures at different gel stiffness. Table 3: Reagent volumes for the setup of gels at different stiffness (gel volume: 30 µl). 1Volume of 10x CB is calculated for the total gel volume minus the volume of the cell suspension to ensure isoosmotic conditions. Use 10xCBpH5.5 for fast gelling gels and 10xCBpH7.2 for slow gelling gels. 2 mMol/L thiol-reactive groups are used for crosslinking with 2 mMol/L thiols from PEG- or CD-Link) to provide a constant gel stiffness. Table 4: Final concentrations of reactive groups when setting up gels at different peptide concentrations. The corresponding reagent volumes for setting up these gels in volumes of 30 µl are shown in Table 5. Table 5: Reagent volumes for the generation of gels (crosslinking strength: 2 mMol/L) with different peptide concentrations. Dextran hydrogels containing intact cells can be dissolved by adding dextranase to the culture medium of the 3-D hydrogel culture. If needed, cells can be chemically fixed (e.g. with 4% formaldehyde in PBS) prior to the dextranase treatment. For example, a 30 µl gel can be dissolved with 300 µl of a 1:20 dilution of dextranase in medium incubated for 30-60 minutes at 37°C. Gels can be dissolved faster, if they are cut in pieces. Liu, H., J. Lin, and K. Roy, Effect of 3D scaffold and dynamic culture condition on the global gene expression profile of mouse embryonic stem cells. Biomaterials, 2006. 27(36):5978-89. Schmeichel, K.L. and M.J. Bissell, Modeling tissue-specific signaling and organ function in three dimensions. J Cell Sci, 2003. 116(Pt 12):2377-88. Abbott, A., Cell culture: biology's new dimension. Nature, 2003. 424(6951):870-2. Lutolf, M.P. and Hubbell, J.A., Synthetic biomaterials as instructive extracellular microenvironments for morphogenesis in tissue engineering. Nat Biotechnol, 2005. 23:47-55.
. Nuttelman, C.R., et al., Attachment of fibronectin to poly(vinyl alcohol) hydrogels promotes NIH3T3 cell adhesion, proliferation, and migration. J Biomed Mater Res, 2001. 57(2):217-23. Knight C. G. et al., A novel coumarin-labelled peptide for sensitive continuous assays of the matrix metalloproteinases. FEBS Lett. 1992 296(3):263-6. No or weak gel formation. Thiol-reactive groups and thiol groups used for crosslinking are not near equimolar concentrations Check the balance of thiolreactive groups and thiol groups of your components. Too much peptide or thioglycerol used, resulting in too few thiol-reactive groups for crosslinking. Check the calculations for gel setup. Concentration of reactive groups for crosslinking are too low to form a polymer network (below 1.8 mMol/L). Increase the concentration of both types of reactive groups for crosslinking to >1.8 mMol/L each. Reaction pH too low, caused by acid in peptide sample. Check the pH of the sample with pH-paper; when slow gelling system used: try to increase the portion of CB buffer by reducing the portion of cell suspension or equivalent. To maintain concentration of cells or equivalent increase their concentration in the stock solution accordingly. When fast gelling system used: (partially) replace CBpH 5.5 with CBpH 7.2. Slow gelling gel system used at too low pH. Use CBpH 7.2. Deteriorated reactive groups. Use a fresh sample of reaction components; adhere to storage conditions as recommended in Table 1. Consider technical hints on chapter 3. Gel forms too fast. When fast gelling system used: pH is too high. Use lower pH (CBpH 5.5) for performing the crosslinking reaction or use slow gelling gel system. Gel forms too slowly. When slow gelling gel system is used: pH is too low. Use CBpH 7.2. Vitality of cells decreases rapidly. Cell type requires presence of an adhesion factor or of a different adhesion factor. Add appropriate cell adhesion peptides or extracellular adhesion proteins. When low pH is used: Cells may be sensitive to low pH during gel setup. Use neutral pH during gel setup, preferably with the slow gelling system. Cells require other biomimetic modifications in the gel. Investigate which biomimetic factors may be needed and add to gel if possible. Dissolution of dextran-based hydrogel is not complete after incubation of 1 hr at 37°C with Dextranase. High gel strength. Incubate up to 2 hr; add more volume of dextranase solution; mechanically disrupt gel prior to digestion. Dextranase activity reduced due to long storage at 4°C or higher. Use new aliquot of Dextranase and adhere to storage conditions indicated in the Product Data Sheet. Thiol-reactive polymer solution becomes turbid after addition of peptide. Some peptides may cause precipitation of Mal-PVA after covalent attachment. Try to use a lower peptide concentration. See http://cellendes.com/products for a full list of 3-D Life Hydrogel products.